£40 for first nest and £10 for each additional nest. The wasp nest season is now upon us and over the next few weeks, nests will start to appear in our gardens, roof spaces, house timber and external masonry walls. Attracted to the smell of nectar and cooking, wasps can quickly become unwelcome guests at family BBQ’s and get-togethers. For local hospitality businesses, particularly pubs and restaurants, wasps can also be a real conversation killer for their customers and, if left untreated, nests can become more hazardous as the colony grows and wasp activity increases. 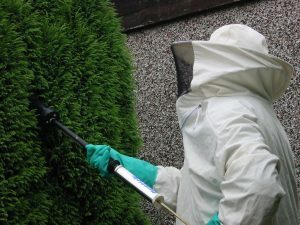 Happily, wasp nest treatments do not take long and at Heritage Pest Control, we offer a fast and efficient treatment service that comes with a 100% guarantee. Many of our customers come back to us each year and we are often able to schedule in a same-day treatment if we are operating in an area near you at the time of your call. Call us today on 07905 904880 in the first instance or on our mainline number 01580 388704 to talk to one of our operatives and arrange a visit. 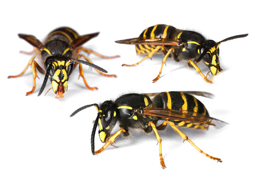 Read more about wasp nests and their extermination in our Life cycles section. “I would not hesitate to recommend Heritage Pest Control, their quality of service, efficient and professional attitude has been second to none. is a professional, family-run company dedicated to the removal of rats, mice, wasps and numerous other pests from local homes and businesses serving Tunbridge Wells, Tonbridge, Sevenoaks, Cranbrook, Tenterden and the surrounding areas. Our technicians have a wealth of experience and are all BPCA Diploma 1 & 2 certified. This means that we really know our business! So as well as treating pest infestations, we can also advise on insects and rodent behaviour, health and safety issues and what you can do to help avoid problems in the future. As a member of the British Pest Control Association, we are also able to access essential industry research and data along with evolving methods of treatment. In addition to our call out work, Heritage Pest Control is also well placed to manage annual contracts for local businesses in search of a more long term, preventative approach to pest control. We have a wealth of experience in this area having gleaned from working with a wide range of clients including large hotel chains, the Ministry of Defence and even Royal Palaces! We offer competitively priced contracts that are tailored to the needs of each individual business. With so much experience in the field, from rat control to wasp extermination and much more, there is very little that we haven’t seen before and so we are able to deal with the unexpected quickly, efficiently and discreetly. Finally, we believe in keeping disruption to a minimum and allowing your everyday business to continue while we get on with ours. Why Choose Heritage Pest Control? Because most of our customers are located within a 20 mile radius of our offices, we can keep travel costs down to a minimum. We then pass on the savings we make to our customers through extremely competitive call out and contract rates. Whether you are a small coffee shop with a large wasp nest over your entrance door or a food production factory requiring 12-24 routine visits a year, our locality enables us to respond quickly to unplanned callouts and still be prompt and efficient in our management of contractual routine visits. At Heritage Pest Control we understand that many businesses, particularly in the hospitality sector are uncomfortable advertising the need for pest control on site, which is why we use a small fleet of unmarked white vans for all visits and callouts.